Contributor Grigorelis created this memorable drone video of a little known Greek island called Spinalonga. It actually wasn't originally a separate island; it was created by the Venetians, who controlled Crete for a time and "disconnected" Spinalong from the thin peninsula which had connected it to the Crete mainland, building a large fortress upon it. 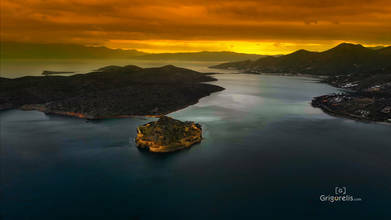 In the 20th century, Spinalonga served as a leper colony, the last such instance to remain active in Europe. Description: Spinalonga Island is a historical monument in Elounda Bay at Lasithi region in Crete Island Greece.